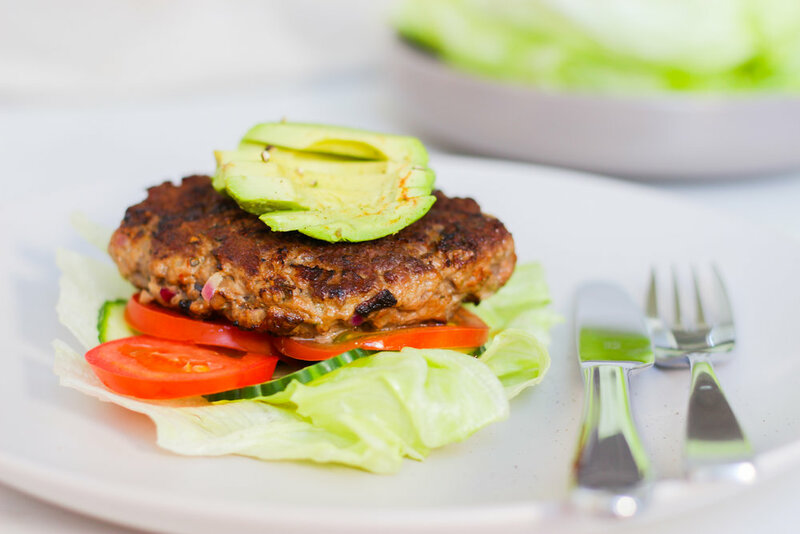 This recipe for bunless burgers is the dinner meal from week 1 of the 12 Week Mind & Body Transformation ebook. It is such a great family friendly recipe and super easy to make. You can also make these patties into cute meat balls that kids will love. If you would like to find out more about the Mind & Body Transformation ebook then sign up for the free 7 day experience and check it out. The ebook is an educational programme where each week you learn how make easy lifestyle changes that you enjoy and actually sustainable. Plus each week you get 4 new, healthy and seriously tasty recipes to try! To make the beef patties mix together the beef, carrot, onion, paprika, herbs, egg, flour, tomato paste, salt and pepper. Heat a teaspoon of coconut oil in a pan on medium heat. Using your hands, shape the meat mixture into 2 patties and cook for approximately 3 minutes on each side or until cooked through. Serve with the salad, avocado and as an option a yoghurt and tahini dressing.